B&B Primavera i Verona, Italien : Boka nu! 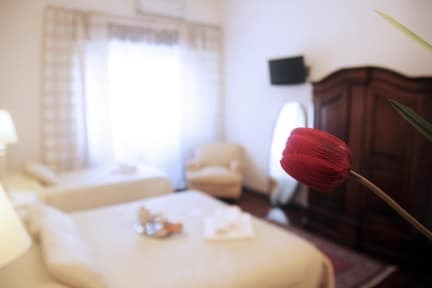 Primavera B&B is located in the heart of Verona, a few steps from the famous Juliet's grave and the Arena (only 30 mts far from it) landmark of the city centre. It's located 950 mts far from the Railway Station Verona Porta Nuova. PRIMAVERA B&B is synonymous with quality and availability. It offers confortable bedrooms finely furnished. All rooms have free WI-FI internet connection. Each bathroom is equipped with hairdryer, shampoo, shower-foam and soap. Towels and linen are usually changed every 3 days; if necessary earlier. The breakfast buffet, ranging from sweet to savory, is based on fresh fruit, croissants, yoghurt, corn flakes, muesli, milk, tea, coffee, bread, biscuits, butter, jam, honey, ham and cheese. PRIMAVERA B&B offers to its guests free parking permissions for the streets surrounding the building. Alternatively there is a guarded fee parking lot located 50 meters far from the property. Upon arrival, every customer will receive a set of keys so to be free to go and come back any time. The owner put his knowledge and courtesy at disposal of the guests in order to make a more pleasant stay in Verona. We take preauthorization on credit card. Late check in costs 25 euros (after 21:00 until max 23:00).